If you've ever gone out to bid on a Brady machine or supplies, you realize quickly that there isn't much to be gained in the bidding process on a proprietary, locked machine. That's because Brady controls the pricing in the market! Duralabel is in the same boat. The machine will only work with one type of supply, so the price is fixed. You'll get a token savings instead of a real value. 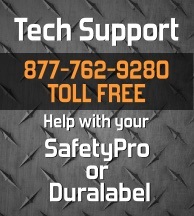 With SafetyPro, we don't keep customers by locking them in with proprietary products. Our products are open and compatible, working with leading-edge industry standards instead of trying to keep customers in the stone age. That means when you go out to bid for your labeling job, ISS can provide you with prices that blow Brady and Duralabel out of the water. So make sure, when your client asks for a Brady labeling supply or machine bid, you offer to include a competiting bid from ISS. We will help you through the process when you call 877-762-9280 today!